Early childhood education is the key to the betterment of society. At HADAYA we fully believe this to be true and so we are very happy to be supporting our latest project - Maha's Montessori Mission. Maha is igniting a Montessori movement across refugee communities worldwide! Let's help these families rebuild a better Syria! Their future is at stake. Your support is critical. For the latest update on Maha’s Montessori Mission, read our Blog here. Born in Cairo, Egypt, Maha is a mother of three, world traveller and a career teacher who holds a masters degree in early childhood education/Montessori and an undergraduate degree in Egyptology. She was in the process of pursuing her Ph.D. in 2016 when things changed. She decided that academia was not for her. Instead, Maha listened to her students at Somerfield Academy in Bermuda (average age 3-6 years old) - they inspired her to go and physically make a difference and help her fellow humans. She wanted to make a difference in the lives of refugee women and children by offering them access to Montessori education and by training adults to become certified teachers. 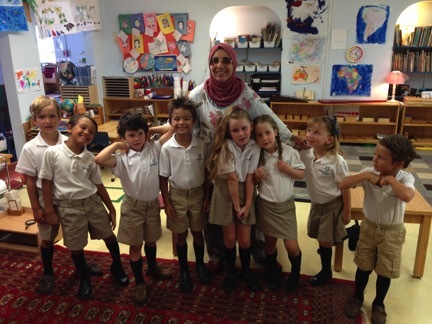 One day, in her own classroom in Bermuda she and her students were discussing the Syrian refugees and the countries that accepted them and the others that did not welcome them. The children decided they wanted to do something to help, by polishing shoes to raise money for Maha's first trip to Jordan. We happened to meet Maha in Jordan, while working on another HADAYA project, and were so impressed by what she was trying to do that we vowed right then and there to help her in any way we could. 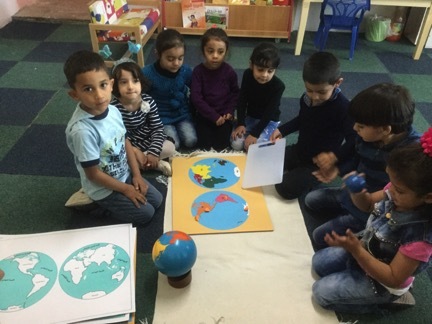 The Center for Guided Montessori Studies, which is affiliated with The International Montessori Council, plans to partner with Maha to provide a MACTE (Montessori Accreditation Council for Teacher Education) accredited Early Childhood Teacher Certification program for these two groups of Syrian refugees in Jordan and Istanbul. Maha has been very busy training over 40 women who wish to be certified as Montessori teachers - the Montessori method of Early Education is highly respected in the Middle East and the whole world, so earning this certification is truly empowering for them. It also means that their certifications will be authentic, recognized by all schools internationally, and their prospects for future employment will be promising. Maha is already preparing for another school (and hopefully many more! ), as well as beginning training, for more Syrian refugees in Karkamish, a refugee camp in Southern Turkey, close to Aleppo, Syria (see last photo, far right, in the group below). September 2018 - for the latest update on Maha’s Montessori Mission, read our Blog here. HADAYA is committed to helping Maha achieve the goal of opening many more Montessori pop-up schools and hundreds more trained and qualified Montessori teachers to run them. This will not only impact the refugees directly by providing opportunities for education, both children and adults, but give them hope for a better future - one where they can support and sustain themselves and their families. More long term, it will impact the future generations -- as we all know, the children are our future! By the end of the 2017-2018 school year, these 40 new Montessori-trained teachers need to pay $600 each for their official and final Montessori certifications. That's a total of $24,000 to directly impact hundreds, probably thousands, of refugee children. Together, we can make that happen...and make a big impact on their futures!